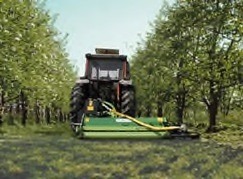 The BULL grass pruning/shredder is used for grass cutting and pruning up to 5 cm in diameter. The BULL model with closed rear cover is used in urban, municipality green areas, motor ways, airports etc. The BULL model with open rear cover is used in wide agriculture fields to reduce maize stalks, cotton or grass and pruning on vineyards, orchards etc..